The question of journalism ethics and boundaries has no firm answer. “I say, my job is not to publish fantastic stories for you to read, go to your bedroom and smile. My job is to tell you the hard facts as they are,” says Anas Aremeyaw Anas. Photo: Lerato Mokhethi. Award-winning Ghanaian investigative journalist Anas Aremeyaw Anas has encouraged journalists working in Africa to “get out of dogmatic ways of doing journalism”. 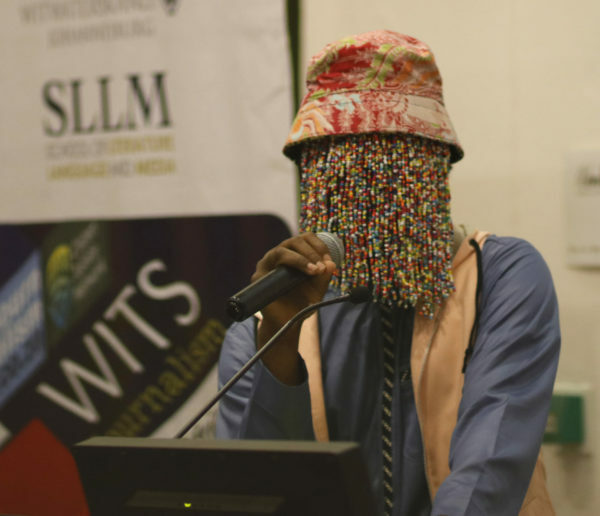 Anas was speaking during a plenary at the 14th annual African Investigative Journalists Conference (AIJC) in Johannesburg, on Wednesday, October 31. Anas, who appeared in a beaded veil to hide his identity, addressed a packed auditorium some 12 hours after international football association FIFA announced a lifetime ban of former Ghanian football association president Kwesi Nyantakyi following Anas’ expose of Nyantakyi for bribery and corruption. “My friends in the West don’t like me for saying this but my principles remain naming, shaming and jailing and I believe that we must go beyond the kind of journalism where we tell stories and leave it up to the law,” Anas said. He went on to detail how his unconventional methods of journalism have helped expose corruption in the highest levels of society. He has caught corrupt football receiving bribes on hidden cameras, posed as a mentally ill patient at a psychiatric facility and disguised himself as a ‘client’ with a malformed child in order to expose the killing of children with congenital defects. “I’ve realized that when I film people with hidden cameras, it helps to reveal their true personas and shows what they normally do away from watching eyes. If someone is caught on camera taking bribes, chances are he has done it before and will do it again. This shows people for who they really are” he clarified. In response to a question about the violation of an individual’s right to privacy, Anas said, “What I do is to place the public interest first while not necessarily being unethical”. Anas’ work has received international praise from prominent figures such as former US president Barack Obama, who described him in 2009 as a “journalist who risked his life to report the truth”. Wits Vuvuzela Atrocities of human trafficking and smuggling October 2018. Wits Vuvuzela Going beyond the data in a leak investigation October 2018. Wits Vuvuzela They kill the journalists not the story October 2018.